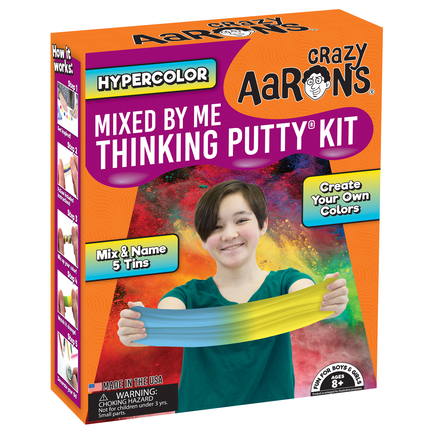 Create your very own color changing Thinking Putty® with the newest Mixed by Me® Kit from Crazy Aaron’s®! Each Hypercolor® kit includes five tins of clear putty, three Chiller concentrates, three Thriller effect putties, and an instructional mat—everything you’ll need to make awesome heat sensitive Thinking Putty just like Crazy Aaron himself! When the mixing is done, the fun’s just begun! Play with your new creation and watch as the putty changes color right before your eyes.